This turned out by far the most difficult bike ride I had ever tackled. I learned the hard way, don’t try a tough double century only 12 days after running a marathon, especially one with hot temperatures. I also learned that general conditioning is not sufficient. Targeted training for distance, climbing and riding in the heat are needed. With the hot weather I should have taken a Camelbak in addition to two water bottles. Most everyone was running out of water between some of the rest stops. That is the receipe for dehydration. I felt good in the morning as we climbed Mt. Diablo and then Morgan Territory, and was riding fast enough clear to the Mines Road rest stop. After another brief stop there I headed for the junction. I looked at my watch when I hit about the half way mark of 103 miles and roughly 10,000 ft. of climbing and saw I had taken 7.5 hours. Not bad, I thought,so that meant I could finish in about 15 hours, our around 8 pm. But then the problems began. People were dropping like flies. I usually do well in the heat, but something seemed to have gone wrong suddenly. I started to feel weak and sick. I was completely out of water by the time I hit the lunch stop at the Junction. I decided to take a long lunch, maybe around 30 minutes, unlike the Solvang Double were I was shoving food down and then jumping back on the bike. I was feeling a bit better as I headed toward Mt. Hamilton were I was able to draft behind a tandem. I started the climb up the backside of Mt. Hamilton and felt strong again, but I was worried about running out of water again so I was conserving it, but probably too much. About half way up I started to cramp, big time. All of a sudden I couldn’t even peddle and I felt sick to my stomach. I had to get off the bike and sit in the shade. I looked at my legs and they were drenched in sweat. I had never seen that before because usually in California the sweat evaporates about as fast you you can generated it. Then I started to lay down on the dirt along side the road. Some other riders were stopping around me, doing the same. The SAG drove by and I motioned to them all was okay, becasue I was NOT going to be SAGed in. After about 10 minutes I tried to get back on the bike but the cramping started again and was very painful, so another 10 minutes on the ground. I then tried a 3rd time and I could not peddle. I decided to start to walk the bike and try to work it out. I walked to the spring and drenched myself. That plus the walking helped and I was finally able to get back on the bike and finish the accent. I knew once I reached the summit it would turn a bit cooler and I was then confident that I could make it, but would need to do so with a slow pace and lots of resting. I spent a long time at the Crothers rest stop. I was trying to get my stomach feeling better, give myself some time to hydrate and hopefully have it cooler before doing the last major climb up Sierra. Four riders were being SAGed in from there. When I did start up Sierra it was still 85 degrees but I was able to keep from cramping again by riding slow. I was very glad I had followed the advice to bring my old bike with the triple crankshaft. I don’t think I have ever climbed up Sierra so slow before. Lots of people were walking their bikes. A rest stop past the summit is where I had sent my lights forward to and it was a good thing because I needed them. The sun was just setting and I had to ride half of Calaveras in the dark. It was cool now and I found myself riding fast again, like in the morning. I arrived at Sunol, the last rest stop at 9 am and learned from a club member there who had DNFed that several others had also. I was not going to give up at that point, so continued on chasing some riders in the dark. I was close behind two fast riders and noticed the lead one didn’t have any lights at all. They made the right turn to go up Palomares and bam! they both went down hard, slipping on gravel (which was hard to see at night). I was lucky that I avoided hitting them. I helped them to get up and used my lights for them to check themselves and their bikes. We then started the climb and I went ahead, not wanting to be around those guys any more. I was climbing well now but most people were still climbing like a tortoise. Here is the graph from my Polar HRM. You can see that my heart rate was much lower the second half of the ride. While on the bike, I averaged 14.4 mph, which is not too bad considering the climbing. It was the stopping time that really added up. That is the question! With the super difficult Devil Mountain Double coming up on Saturday I was thinking I should take two full days off from running and biking. It was hard today, kind of just doing stuff to clean up my desk and other things and not getting in any physical workout. With all the marathon training I was use to doing at least one major workout a day and some days doing multiple workouts. So my body just doesn’t do well getting too much of the “R” thing (rest). Thursday’s we usually mountain bike at 5:30 pm, at a place called Harvey Bear Ranch. It is a county park, only about 8 mile drive from my home. I just couldn’t resist and finally went on the ride. But I did take it real easy and used a much lower gear than usually do so I would spin more and use less leg strength. So …. tomorrow I promise no physical activity, honest. The guys I went mountain biking with are all doing the Mt. Hamilton Challenge ride on Saturday, the ride I should be doing. That ride is tough enough, but I know I could do it. Instead something crazy inside of me pushed me to take on a challenge that I am not 100% sure I can finish without getting sagged in. I guess in life you need to do some things that challenge you to the limit. Some try to discourage me from over extending while others have the confidence that I can handle it. It is overcoming those challenges that helps you to understand who you really are. Those who live inside their comfort zone live a very narrow life indeed. I feel a bit like in college burning the midnight oil cramming for the final exams. With the Devil Mountain Double (DMD) fast approaching and being mostly not riding for 3 weeks due to the marathon taper and post marathon recovery, I did get in some good miles this week with 75 on Tuesday and 62 today. But just like staying up late to study for an exam, I am wondering if this is going to help or hinder me come Saturday. The body does take some time to repair itself after a work out and without getting through that repair time, I suppose you do more damage that good. I guess I will take it easy today and tomorrow. I am planning on doing the 5 am start. The start location is over an hour from my house so that means getting up at 3:15 am and out the door in 30 minutes. I am not expecting to finish until past 10:30 pm. That who period will be on the bike except only about an hour total at the rest stops. It is going to be some day. I only wish I had another week to get ready for it. It would have been much better to do the Mt. Hamilton Challenge this Saturday and the DMD the following, but they fall on the same day. I did the Mt. Hamilton Challenge a couple of times before and recall seeing the DMD riders going the opposite direction on Mines Rd. and thinking how stupid could anyone be to do that ride! What was I thinking when I decided to do the Devil Mountain Double this Saturday. It is one of the most difficult one day bike events in California with 206 miles and 20,000 feet of climbing. My original plan was do the Mt. Hamilton Challenge this Saturday which is tough enough with 125 miles and 9,000 feet climbing, but the DMD is like twice as hard. I am not sure I am in shape so I did a 70 mile bike ride today, biking from home and then doing the Metcalf Mauler. I tested out a light system I borrowed for Saturday because unlike the Solvang Double Century, I WILL be riding in the dark. I anticipate starting at 5 am and not finishing for 17-18 hours, which means past 10 pm. Some people I ride with did not finish until 11:30 pm last year. Normally I would not even do this ride if I had trained specifically for it, but I have not been on the bike that much lately because of the Boston Marathon. I just must be crazy! 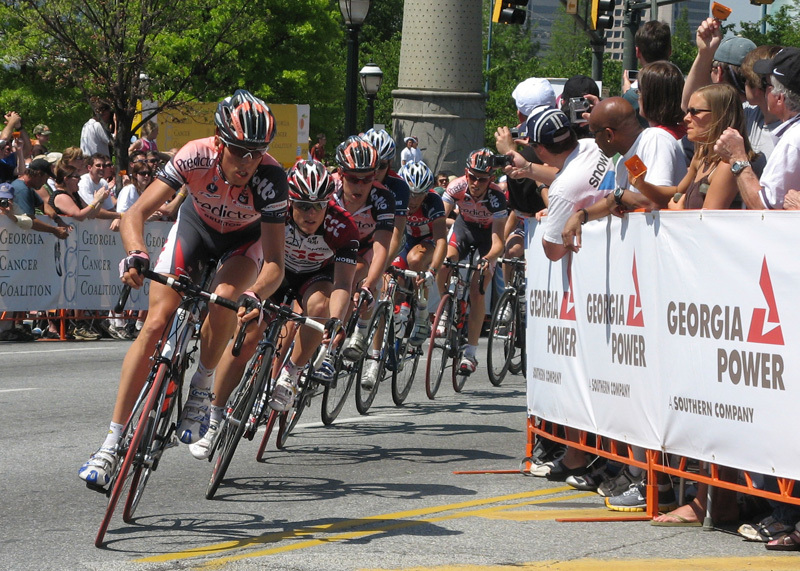 It was a beautiful day in downtown Atlanta to watch the 7th and final stage of the Tour de Georgia. We drove down with the grandkids to meet John and Amy before noon. While we were waiting for the 1 pm start, we went over to the area where the pro cycling teams had their busses parked and waited for the Discovery team to come out. Lance Armstrong was down here. Kyle, my 5 year old grandson, got his autograph along with autographs from Levi Leiphemer, George Hincapie and Johan Bruyneel (team manager). With seven loops we had a wonderful chance to see pro cyclists serveral times. I moved from spot to spot looking for a good location to take photos. This one I took from accross the street. 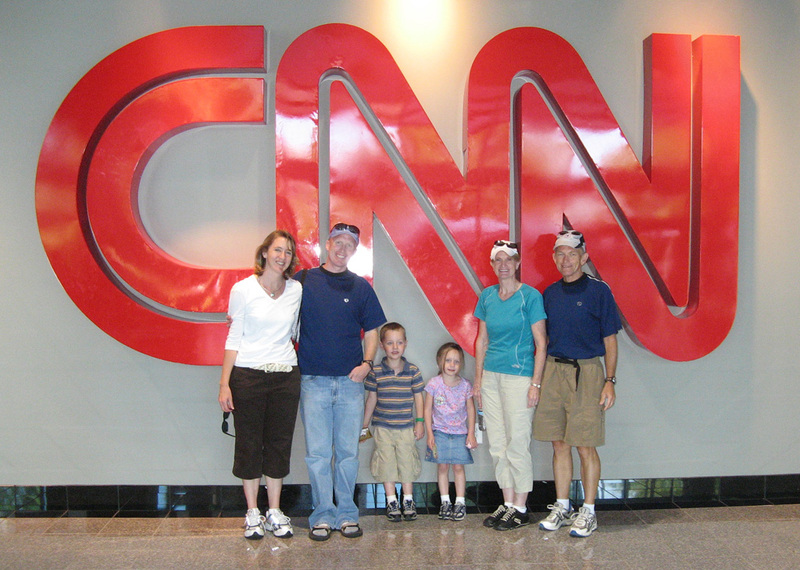 After watching a couple of the laps we all went over to the CNN building for lunch in the middle of the race. This format also allowed me to get some good pictures, like this one. Click here for my cycling photos. After the last lap went by us, we moved to try to see the finish. 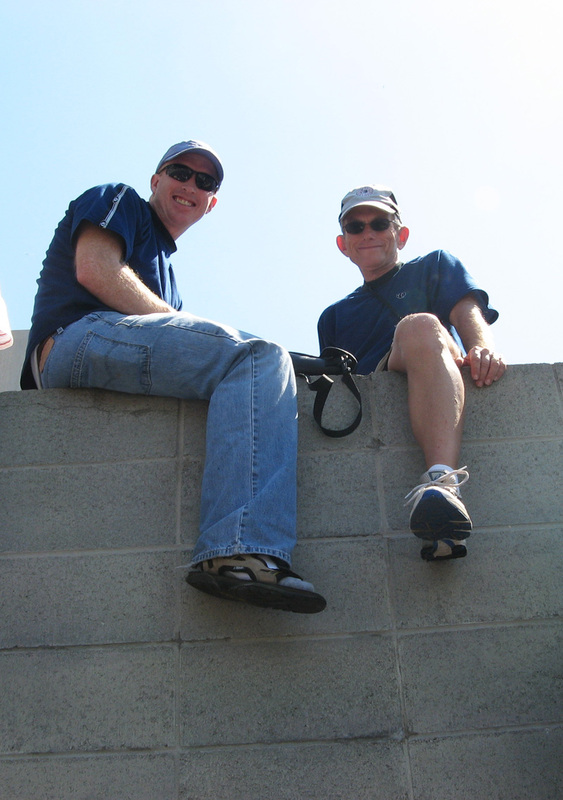 It was so crowed that John and I climbed up on a wall, but even up there we couldn’t see much. This morning John and I went for a jog along a river. It was my first run since the marathon so I kept the pace down. Later in the morning we headed out with everyone to Stone Mountain, where Stage 6 of the Tour de Georgia was going to finish. 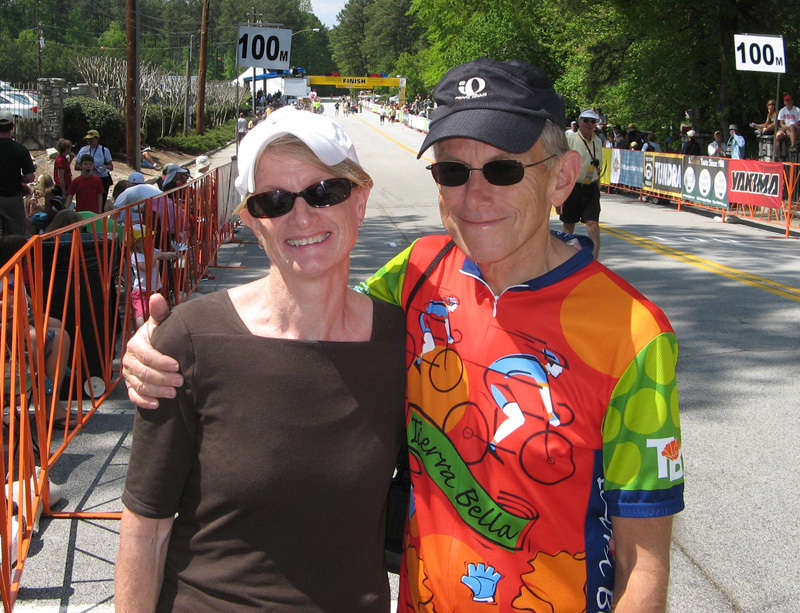 While Ann, Amy and the grandkids went into the park, John and I went on the road bikes about 10 miles, circling the Stone Mountain park and scouting out where the Tour would go. We found the finish line, which was less than half a mile from where we had parked the cars. We called Ann and Amy and met them back at the car and we all went down to the large expo area, collecting a bunch of goodies. We then positioned ourselves at a spot only 100 meters from the finish. This stage had the riders come through the finish, then on a 7 mile loop, and then ending at the finish line, so we could see them twice. It was amazing the speed they were going. Unlike the prior day with a mountain top finish, it was difficult to get any pictures. But it was exciting to watch the sprint finish. Freddy Rodriguez was the stage winner. 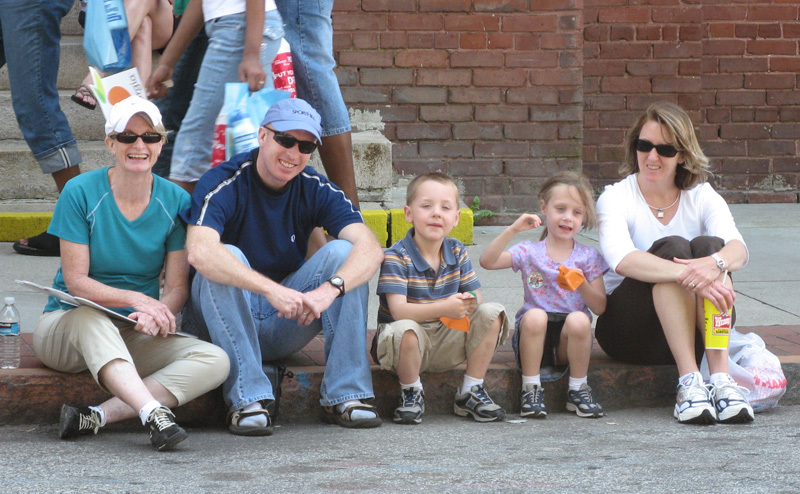 John and Amy were going to spend the night in Atlanta, so after the race we took the grandkids back into the park for an hour while the traffic cleared. 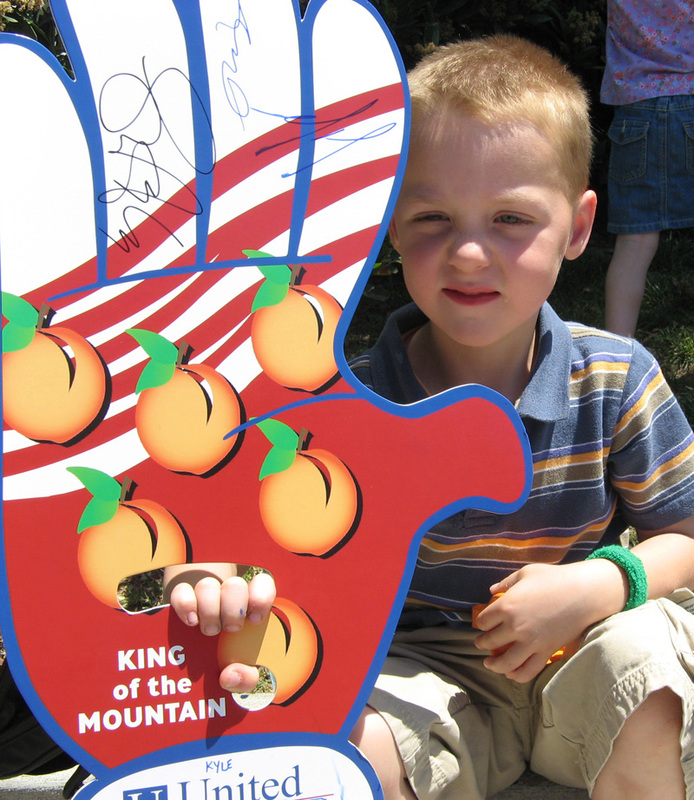 I asked Kyle what he liked most about the day, thinking it would be one of the many attractions in Stone Mountain, but he said it was the race. Good going Kyle! John and I went to watch Stage 5 of the Tour de George. This stage had a hill top finish up Brasstown Bald. We took road bikes and parked about 10 miles from the finish and biked in. The last 2-3 miles was a steep climb where the pro cyclists would be going later in the day. I was on my daughter-in-law’s bike which had a triple crankshaft but since John only had a double I decided to do the climb in the middle chairing. I passed about 50 other bikers on the way up. There was one section that was very steep and I had second thoughts about trying to keep in the middle chainring, but I decided to grind it out. I noticed that most all of the other cyclists were now walking their bikes, but my pride would not let me stop. I finally made it past that part and the grade returned to simply “steep”. Up near the top was a level area filled with big crowds and an expo. The actual finish was up another 1,000 feet climb but they would not let us ride bikes up there. One offical said it was too steep except for the pro cyclists, but I knew I could climb it. Nevertheless we had to walk up a ways where we sat and waited for the cyclists to arrive. Here is a photo of the stage winner, Levi Leiphimer. Click here for more cycling pictures. It was amazing to watch the pro cyclists climb this steep section. After the entire field came up we walked back down to get our bikes and waited for permission to head back down the hill. I kept the decent speed down since I was not on a a bike I trusted completely. As we were about half way down there were several emergency vehicles which we had to walk our bikes past. We could see they were administering CPR to a cyclist laying on the ground. Someone said the person was coming down too fast and it was a terrible crash. I was glad I was careful! After the steep decent we raced back to the cars and then a two hour drive back to Atlanta. Here is my last entry on the Boston Marathon. I have updated my other website with some small images, my stats, and a graph that shows my 5K splits. I put this on a page where I keep track of the marathon results for me and my two children who run marathons. Click here to view. This chart is kind of interesting. I did a scatter plot of my 5K splits against time. 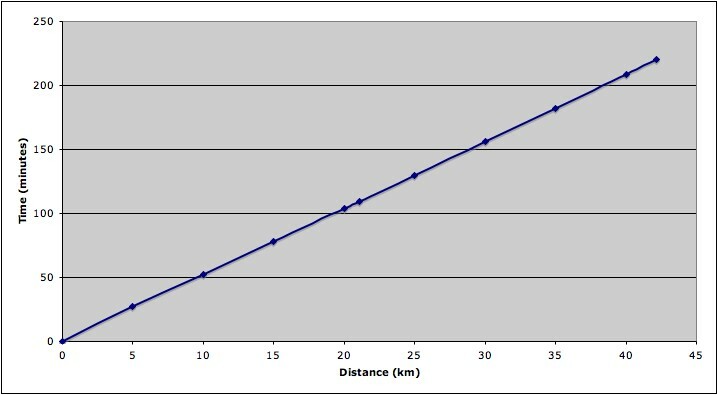 Since this chart is rather straight it meant I was running a constant pace. I sent this email to people in our bike club. Thanks to many of you for the well wishes in running the Boston Marathon. Despite the stormy weather I was able to finish with a time of 3:39:59 (yes my watch stopped at 59 seconds just as my crazy birthday times). Although that was 5 minutes off my PR I was happy with time and it was fast enough to qualify to run Boston again, should I wish to next year (but this was going to be my LAST marathon, right?). While I was pounding the pavement on a marathon I like to let my mind roam so I don’t think about my legs shouting at me. The thought came to me about how biking had really helped me run this marathon. I once read a book called everything I ever needed to know I learned in kindergarten. Maybe everything I needed to run this marathon I learned on the Metcalf Mauler. 1. Don’t stop until you reach the top, it is too hard to restart if you do. 2. Attack on the hills and recover on the downhill. 3. Dress right for the weather, with the right clothes in peelable layers. 6. In stormy weather, go to the ride start, it will clear up when you get there. 7. When my marathon training program calls for rest/cross training, that means go on a bike ride!